The traditional school calendar consists of 10 months of school with a big break during the summer. During that summer, students lose about 2.6 months of learning. Year-round school, school that runs during all four seasons, could be a potential way of keeping that learning continuous (Bennecke, 2012). What is a school calendar? A school calendar is the requirements, based on state, for a school to be in session. This includes how many days the students must attend, how many hours of instruction must be given, and how many hours qualify as a day for instruction (Education Commission, 2017). How time is spent throughout the year-round school calendar. This is a type of school calendar that can also be referred to as a balanced calendar. With this type of calendar, the school year has 6 to 9 weeks of learning in a row that are broken up by either 2 or 4-week vacations (Pros and Cons of Year-Round School, 2018). It can have multi-tracking, the practice at which 2-4 groups of students go to the school at different times, as well (Carter, 2008). Although it is school year-round, this calendar still consists of the same number of days that the traditional calendar does (Mahoney, 2007). The school building gets used during the entire year (Research Spotlight, 2017). The students don’t forget what they learned over summer vacation (Pros and Cons, 2018). It can ease overcrowding in schools by using multi-tracking. This way not all students are attending the school at one time (Pros and Cons, 2018). 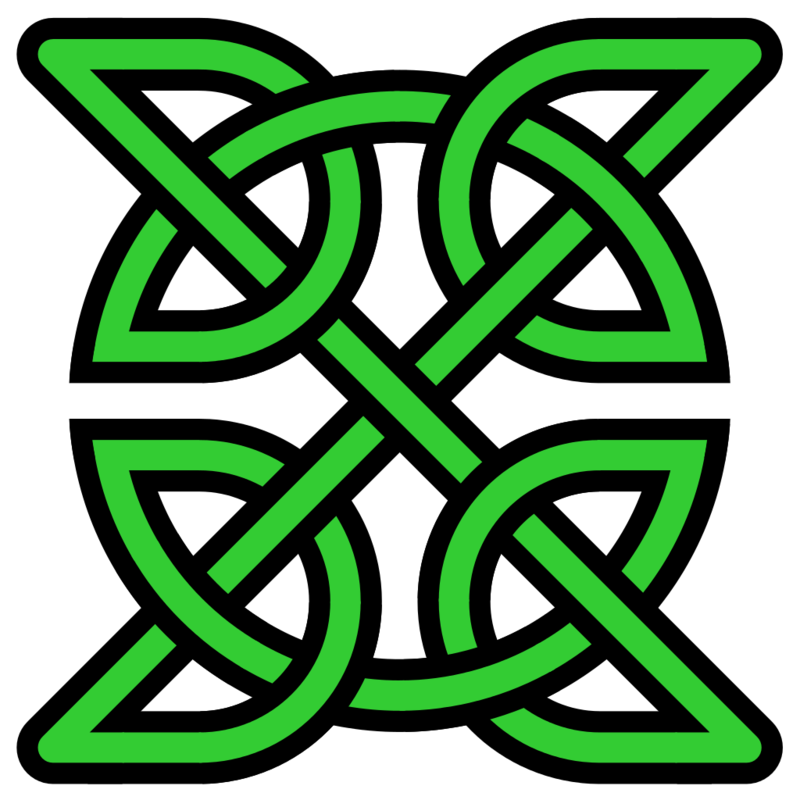 It prevents children from falling behind during the summer because its summer is only half as long as the traditional calendars’ summer (Mahoney, 2007). It helps students whose first language is not English by giving them constant reinforcement of it throughout the entire year. The longest they’ll be away from the school would be thirty days (Carter, 2008). There could be scheduling conflicts for sports, band, and family vacations, especially if families have children in both traditional and year-round schools. (Research Spotlight, 2017). It limits the time for teachers to update skills and earn advanced degrees (Bennecke, 2012). Finding childcare for the students during the two to four-week break can be difficult (Pros and Cons, 2018). Since there are the same number of school days as a traditional calendar, the students do not learn more (Mahoney, 2007). It can cost more money because the school runs all year. Utilities cannot be shut off. (Carter, 2008). 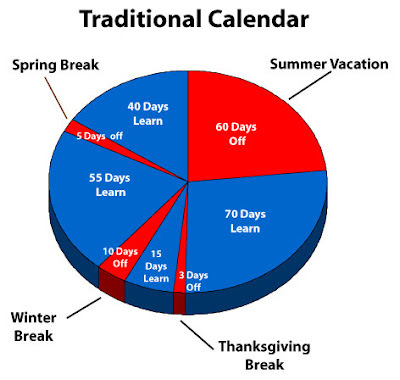 How time is spent throughout the traditional school calendar. This is the type of school calendar that most cities in the United States use. It consists of 10 months of school with big breaks that are not spread out evenly and typically has a summer vacation that lasts 2.6 months (Research Spotlight, 2017). There is less of a chance for teacher burnout because teachers also get to enjoy the 2.6 month long summer vacation (Carter, 2008). Students get a long summer break as well as their teachers. This gives students a chance to partake in authentic experiences over the time out of school, if possible (Bennecke, 2012). There is less short-term learning loss (Carter, 2008). Most people have grown up with this type of calendar. Since most people have experienced this, they don’t have many questions and aren’t as skeptical about it (Bennecke, 2012). Longer breaks have more days for vacations (Carter, 2008). At the beginning of the school year, teachers spend a lot of time reviewing the previous year’s material before jumping into the new year’s, because students tend to forget a lot of information over the summer (Bennecke, 2012). Students lose 2.6 months of learning over summer since they’re not formally being taught (Bennecke, 2012). Teachers get less time to reflect on their teaching and students’ best learning styles (Bennecke, 2012). Since the building is unoccupied during the summer, it costs less to operate. This is because utilities such as water and lights can be shut off (Carter, 2008). There can be overcrowding because all students attend at the same time (Pros and Cons, 2018). Researches are still working on the case on whether or not year-round schooling is triumphant over traditional schooling. According to Paul von Hippel, a sociologist at Ohio State University, “It appears that the learning and forgetting balance out about the same way on a year-round calendar as on a nine-month calendar”. While researchers have tried to compare test scores between the two calendars, the tests were taken at different times in the year so the results could not be considered conclusive (Mahoney, 2007). Yet some teachers still feel their students are benefiting from the year-round calendar anyway because they “… feel when they come back that they haven’t forgotten everything they learned, and they’ll say that themselves” (Mahoney, 2007). Even though there has been extensive research done on the topic, the results have been inconclusive (Research Spotlight, 2017). It’s unknown if the year-round school calendar is better than the traditional school calendar. When it comes to academics, there’s been inconclusive research, so we have no way of knowing if one is actually better than the other (Research Spotlight, 2017). There are several pros and cons to both types of calendars, so it is very important for educators and students to know what they’re signing up for. I believe that the best way to figure out which one is better depends on the individual. Trying out both calendars will give you the best idea of which one you prefer. Although I’ve never attended a year-round school, I’d definitely like to give it a shot. I think that enrolling into one would give people the real-life experience that you can’t gain from only reading about it. ← How to include kids with autism in the modern day classroom.